Merry Christmas from dAniEL gReY on Vimeo. I know I've been missing from this space for so long. Life has been full - I've been writing, cooking, sleeping and growing. It is with every ounce of gratitude that I thank you for coming here and sharing such beautiful words of comfort, encouragement and inspiration. I'm signing off till early January, with a more detailed post about just how blessed our 2011 is going to be. wishing you an absolutely beautiful Christmas. I first met Hailey Bartholomew when I interviewed her for a magazine article. She spoke to me about her Gratitude Project - a simple yet inspiring way to practice gratitude in the everyday. Hailey is a mother and talented photographer and filmmaker. She has two young, gorgeous girls and knows all too well the pressure placed on our kids these days. There's just no denying that our children are growing up in a much bigger place - challenged by the bright, bold adult world that seems to lure them in at such a young age. Hailey's concern about her daughters' wishes to want to be like someone else inspired her to make Ruby Who? She has achieved international success and the film has been welcomed with open arms by teachers across Australia. With the help of teachers and psychologists she has just completed an educational kit that is available to parents and schools. I had the pleasure of interviewing her and I've posted her answers below. I truly believe that this is a DVD that needs to be seen by us and by all our children. A national family movie night, I say! Hailey has kindly offered to give one of you a copy of Ruby Who? along with some stickers and "I Like To Be Me" badges. Please leave a comment below and if you would like to spread this very positive word I encourage you to write a post about it...if you do so you can leave another comment and go in the draw twice. Jodi: What inspired you to make Ruby Who? Hailey: I was desperately trying to explain to my eldest (6 yrs at the time) about how always wishing for what other people have will make you unhappy. I thought about how it makes me feel when thinking about what I want or wish for, or when I look at others and wish I looked like them. It was like I would get heavy and less able to be myself. So I took these feelings and tried to turn them into pictures to explain to my girls. Jodi: What is it about? Hailey: Ruby Who? is the sweet story of a little girl's adventure in rediscovering her identity. Ruby wishes for so many things and dreams of being like others. So much so, she nearly forgets how to just be herself. Jodi: How have children responded to it? Hailey: We have shown the film in preschools, schools and loads of film festivals around the world. I have been delighted by the feedback! Little kids and big kids have been able to see that even though Ruby gets all she wishes for, she is no happier. I love the conversations this film and the work-packs have opened up. We have had parents tell us that their kids have realized they don't like who they are! This is terribly sad, but also really important to discover this when they are little - so us parents and teachers we can work together to create happy healthy teens! As parents sometimes it is hard to explain or really bring home a concept like self-esteem - or how what we think really affects how we feel. Jodi: How has it educated and inspired parents? Hailey: We have only just released the packs to parents. Previously schools and educators have used the film in classes and lectures but now we have built resources that even parents can tap into. From our trial run we have had fantastic feedback from parents saying how much their kids enjoyed the film - watching it over and over for days. They've enjoyed amazing conversations that spring from the film and packs. From 5yr olds discussing how what they want and need are two different things, to a 12 year old listing all the things she wishes for - only to realize that maybe she doesn't really want all that after all! Realizing maybe she is happy with who she is! Even taking time to discuss and realize these things is so beautiful. Jodi: You have recently collaborated with teachers and psychologists to create an educational kit to accompany the DVD. What do you hope will come of these resources? Hailey: We hope these will increase discussion between kids and adults. That spending time wanting, versus being grateful for what you already have, really will affect how you feel and what you think of yourself. I hope that teachers and parents will use the tools we created to better know where their kids are at with their thinking on these issues, and also help us all to be aware that gratefulness is a powerful tool! Jodi: From your perspective as a mother, how has it changed the way you parent your girls? Hailey: I find anything that spurs creative discussion with my children is an amazing gift! Creating Ruby Who? was so important for me and my children. 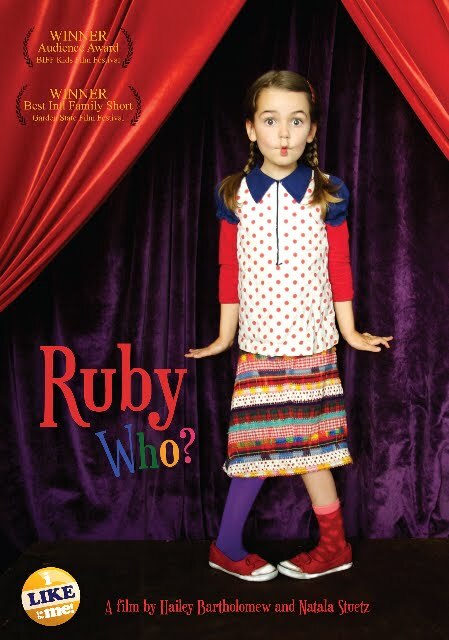 Both girls were in the film and played a big part in creating it... Ruby really is a mix of both my girls! Jodi: What can parents do to ensure their children stay kids for as long as possible?